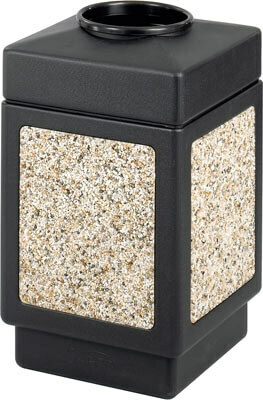 Looking for a receptacle that blends in with any environment? The striking, molded-in stone aggregate will add beauty to your "First Impression" areas. Molded from high density polyethylene with built-in UV inhibitors. The telescoping base hides bag and it has an attractive design with recessed bottom. 38-gallon capacity; uses standard 32" x 44" trash bags. Easily adaptable for anchoring or weighting devices.